The number of trading firms from around the world that have come up to cater for the retail investor's needs are staggering. The deregulation of the markets set up the best opportunities for brokerage firms and financial institutions from around the world to come up and share the market but at the helm of all of this rush for retail market gold was the foreign exchange market. This market which is now the biggest and most liquid market in the world to a tune of $6 trillion dollars you can only imagine what would mean if it were to be open for the retail investor, and for a long time there was a gap but when retail brokerage firms came around and saw the opportunity they could not resist the urge to fill that gap for their sake and that of liquidity providers and the retail investors as well. That is where IronFx comes into play, they have been able to offer one of the best services in the industry creating this bridge between the liquidity providers, the banks, and the retail investors who for a long time could not get their hands on the pie. IronFx is located in Cyprus one of the countries that are known for their role in the financial markets with strict rules and regulations for the market participants in their jurisdiction and the low tax demands that also offer their institutions an easy but affordable business model. The broker, IronFx, has spread its presence to over 180 countries around the world almost all the countries to be specific, and furthermore they have set their operations in different locations around the world, and this makes them an appealing choice for any trader to join. They have 10 offices spread out through the various continents indiscriminately and 45 languages to curb the language barrier reef that obstructs good business practices. One might think that this is enough but you may want to know that they have a wide range of products on offer, they have 200 products in their portfolio more than enough for any trader to choose and create a well-balanced portfolio. The products range from forex, spot metals, futures, indices, shares, and commodities. This is a perfect balance of products that can be used to hedge the risk against each other without exposing yourself to unwanted financial strains. IronFx has also been a competent and compliant broker who has strived to acquire the required license to operate in various regions. In the United Kingdom, they are regulated by the FCA, in Australia by ASIC and in their home country Cyprus by CySEC. All these regulations are to ensure they operate within the global financial standards that govern all financial bodies from around the world. 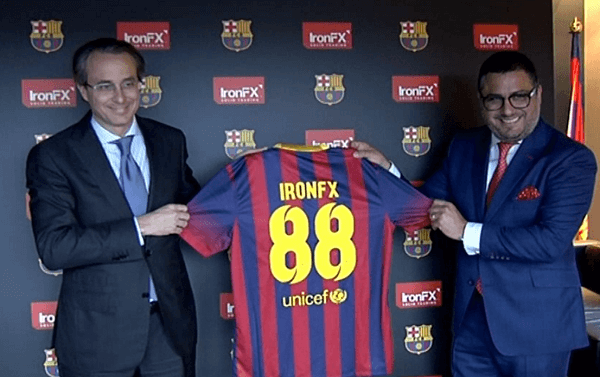 They have been active in ensuring that IronFx becomes a brand that is recognizable by many around the world and that is where their partnership with FC Barcelona comes into place. They have joined forces with this giant of a football club to raise awareness and support the game into financial superiority. One of the core values is innovation, and that can only be envisioned on the types of trading platforms offered by a broker. This is one of the reasons that separates IronFx com from the rest of the fray. They have quite the range of trading platforms that makes them quite the choice for any serious trader. They have a good mix of third party platforms as well as proprietary trading platforms that traders can select from. They have ten trading platforms that range from an online platform to the mobile platform and lastly a desktop platform. This means that a client can choose to work with either of the platforms and they are still going to get the same experience since IronFx has done a great job at optimizing each to work as effectively as possible to cater for their clients’ trading requirements. They have their proprietary trading platform the IronFx which has very many interesting additions coupled with everything that any trader would need to trade effectively. They did not stop there; they know that each trader needs to have that flexibility that is one of the advantages of being a trader, and thus they created the web trading across various browsing platforms. They also support automated trading and mobile trading, and that makes them very appealing to the wider market. IronFx knows that every trader’s success is highly hinged on their ability to make sense of the opportunities presented to them in the markets. That is why IronFx has the education section on their website www IronFx com; they have broken down their resources into easy to read sections, the beginner section where the newbies get a chance to get introduced to the markets and how they work. They also have lessons on economic indicators and their impact on the market. 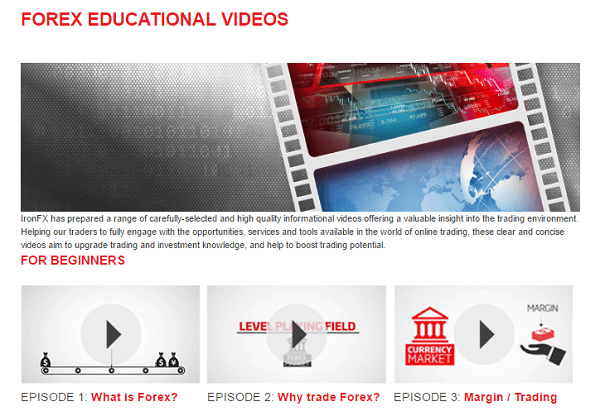 They also have webinars that give the learners a chance to learn from live and practical examples, in addition to the webinars, there is a library of trading videos that can be a good tool for reviewing lessons.